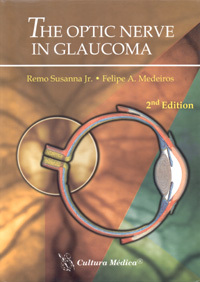 Remo Susanna and Felipe Medeiros do not need an introduction when it concerns glaucoma. Their book is designed for all ophthalmologists and eye care professionals who want to improve their ability to recognize the signs of glaucomatous damage to the optic nerve. It deals extensively with all aspects of the subject and is well illustrated. Publication details: Book. 2006. x and 392 pages. Publication date: 2006. 7 tables and 245 figures, of which 214 in full color. Hardbound. Glaucoma is a leading cause of irreversible blindness in the world. Even in developed countries, over 50% of glaucoma patients remain undiagnosed. Late diagnosis increases the chance of progression to functional impairment. Also, the costs of managing a patient with glaucoma typically increase with worsening disease severity. In the not too distant past, the evaluation of intraocular pressure was considered to be the most important finding to diagnose glaucoma. It is now recognized that high intraocular pressure, although a risk factor for glaucoma, is not the disease in itself. As a progressive optic neuropathy, it makes sense that optic nerve examination should be central in the diagnosis and management of glaucoma. In fact, glaucomatous damage to the optic nerve often precedes the appearance of visual field abnormalities. Even in the presence of visual field defects, progression of optic nerve damage may occur without any detectable evidence of functional deterioration. However, there is evidence that in clinical practice ophthalmologists do not routinely examine and/or document the aspect of the optic nerve. This may be due, at least in part, to a lack of knowledge regarding the importance of optic nerve examination or to a difficulty in interpreting the findings of the exam. The purpose of this book is to familiarize clinicians with the optic nerve examination in glaucoma. In Part I of The Optic Nerve in Glaucoma, each glaucomatous sign of optic nerve damage is described in detail, with discussion of its diagnostic characteristics, clinical significance and pathogenic aspects. Special attention is given to the examination of the retinal nerve fiber layer (RNFL), due to its importance for early diagnosis and for detection of progression of the disease. Although each sign of glaucomatous damage is described separately, the relative importance of each sign and their combined use for establishing the diagnosis and managing the disease is emphasized throughout the book with several case examples. During the past two decades, great effort has been devoted to the development of noninvasive imaging technologies in ophthalmology. As a consequence, we now have a broad array of techniques such as optical coherence tomography (OCT), confocal scanning laser ophthalmoscopy (CSLO) and scanning laser polarimetry (SLP) for glaucoma evaluation. These techniques have made possible obtaining objective and quantitative measurements of the optic nerve head and RNFL structures, reducing the subjective input from the examiner. With so many instruments available for use, it is likely that automated assessment of structural damage is increasing the frequency of optic disc examination and documentation in clinical practice. However, it is still unclear whether clinicians are using this information appropriately. It is also possible that misinterpretation of test results from imaging instruments is leading to over diagnosis and treatment of glaucoma in some cases. Therefore, it is important to provide guidance to clinicians on how to utilize the vast amount of data provided by these instruments. In this book, the 3 most widely used technologies for structural assessment in glaucoma are described in detail, with emphasis on their clinical applications related to the diagnosis and management of the disease. For each instrument, we start with a general description of the operating principles and analysis features, emphasizing issues such as image quality evaluation. The ability of each instrument to detect glaucoma and monitor its progression is discussed in detail along with an overview of what is currently known in the literature about their performance. For each instrument, general guidelines for the interpretation of printouts are provided, along with a large number of case examples to illustrate important points. In addition, a list of relevant references is provided at the end of each chapter to assist the interested reader in obtaining more information regarding a specific subject. In Part II, optical coherence tomography is described in detail. OCT can provide cross-sectional images of intraocular structures, and its use for diagnosis and management of glaucoma has grown rapidly in recent years. Each one of the 3 OCT scanning are-as available for glaucoma evaluation, namely retinal nerve fiber layer, macula and optic nerve head, is described in detail. The advantages and limitations of each one of these methods is discussed and illustrated with case examples. In Part III, we explore the applications of Confocal Scanning Laser Ophthalmoscopy in glaucoma. This technology has over 10 years of use, which has enabled a deeper understanding of its ability to evaluate glaucomatous progression more than any other imaging technology. The algorithms available for evaluation of glaucomatous damage and progression are discussed in detail, illustrated by several case examples. Recent advances in the software are also highlighted. Scanning laser polarimetry is discussed on Part IV. SLP has recently undergone major changes in its hardware and software with the development of variable corneal compensation. The limitations of the SLP with fixed corneal compensation and the motivations behind the development of the variable corneal compensator are described in detail. The clinical applications of this technology for diagnosis and management of glaucoma are illustrated by several case examples. We also describe recent advances in SLP, such as the development of enhanced corneal compensation. Each of these imaging techniques has undergone significant hardware and software improvements in the last few years. Throughout the book, we predominantly describe features and use images from the newest commercially available versions of each imaging technology. In some occasions, images acquired with older versions are shown to specifically highlight the changes incorporated into the newest versions. The field of imaging in glaucoma is constantly changing. Although the information contained in this text is current at the time of printing, research continues at an accelerated pace to provide better ways to image the optic nerve head and RNFL and improve our ability to detect and monitor glaucomatous damage. Finally, we included an Appendix on evaluation of diagnostic tests in glaucoma. The continuing proliferation of medical technology and introduction of new diagnostic tests renders the clinician's ability to critically evaluate these tests more important than ever. In the Appendix, we briefly review some of the basic terminology and concepts used in studies evaluating diagnostic tests in glaucoma in order to facilitate the understanding of other chapters in the book. This book is designed for all ophthalmologists and eye care professionals, even those without a particular expertise in glaucoma, who want to improve their ability to recognize the signs of glaucomatous damage to the optic nerve. If this book contributes, to whatever extent, to help clinicians better diagnose and manage patients with glaucoma and prevent the blinding consequences of this disease, its purpose will have been fulfilled.